The Alhambra is not one palace but several. 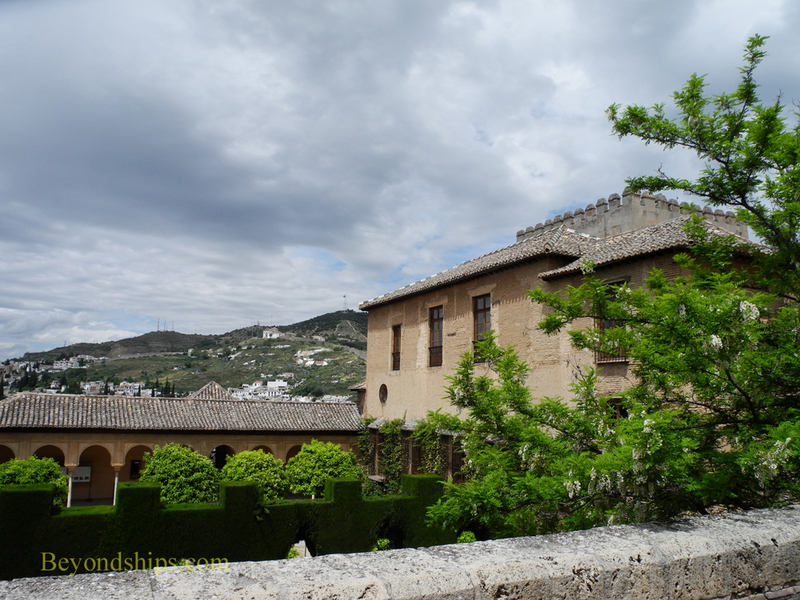 Not only did the Moors build several palaces but as noted earlier, Charles V built a palace within the walls of the Alhambra after the Moors surrendered. In addition, there are various other structures including a church, two hotels and a group of shops. It is a vast complex which demands more than one visit to see everything. 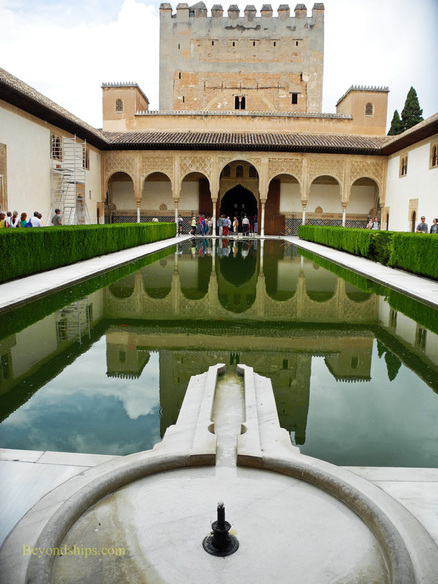 The oldest surviving section of the Alhambra is the Alcazaba. This section was used solely by the military with high ramparts and barracks where the royal guard was housed. 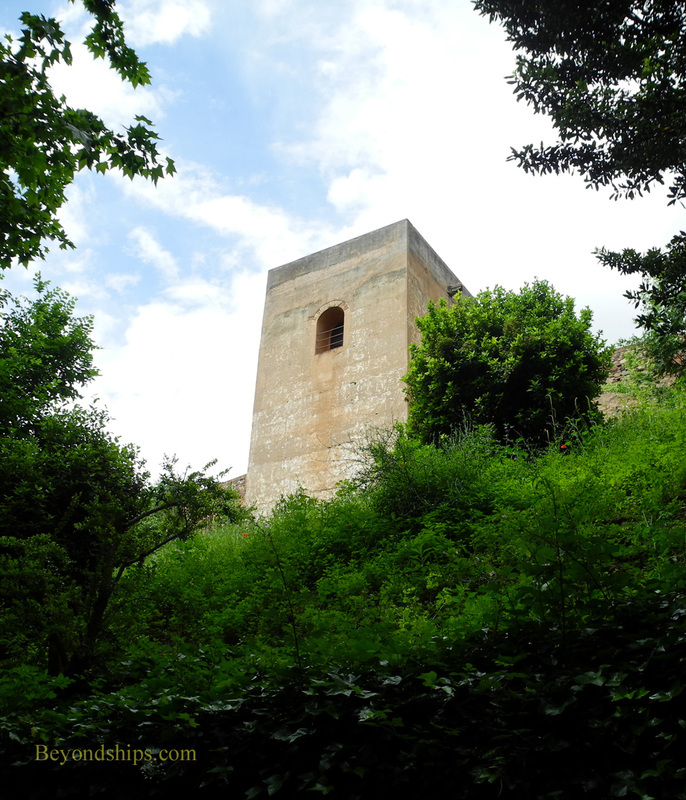 Of the remaining structures, the most notable is the watchtower Torre de la Vela, where the banner of Ferdinand and Isabella was raised to show that the reconquest of Spain had been completed. It offers a panoramic view over the city of Granada below and of the Sierra Nevada beyond. 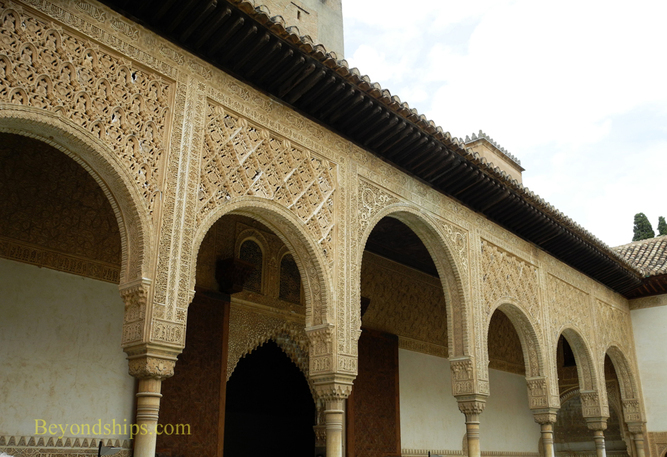 Perhaps the most interesting section of the Alhambra is the Nasrid Palaces. Outside they are austere and somewhat unimpressive. However, inside they were designed to be “Paradise on Earth”. There are three interconnected palaces built in the 13th and 14th Centuries: The Mexuar; The Comares, or Yusuf I Palace; and The Palace of the Lions, or of Mohammed V Palace. In contrast to the rough exteriors, the interior architecture is elegant and fragile. The palaces are built around quadrangles with open air courtyards in the middle. Indeed, the features of the courtyards are the most impressive aspects of the palaces. 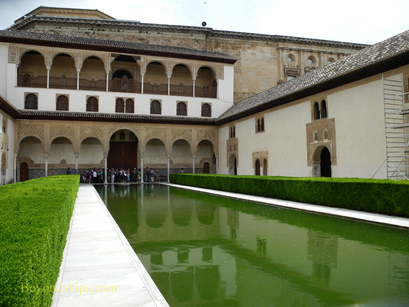 The Courtyard of the Myrtles in the Comares Palace with its long reflecting pool bordered by green hedges on either side is considered one of the jewels of the Alhambra. At the far end of the courtyard, you can enter the throne room or “Hall of the Ambassadors.” This room soars upwards to the roof of the Comares Tower, the highest in the Alhambra. 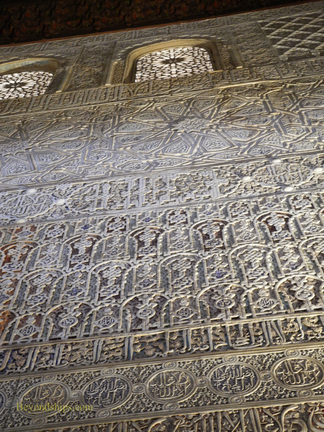 On its ceiling, on the walls and on the remaining section of the original floor are intricate geometric designs that transform Arabic inscriptions into arabesques. Not to be missed is the next quadrangle - - the Courtyard of the Lions with its delicate arches and fountain supported on the backs of a pride of lions. The Lions Palace is where the royal family's private apartments were located and elements of the architecture recall Arab tents. Its artwork is slightly less abstract than in the Comares Palace, reflecting the influence of Christian art. Indeed, the columns surrounding the courtyard are reminiscent of a Christian cloister.